17When Pharaoh let the people go, God did not lead them by way of the land of the Philistines, although that was nearer; for God thought, “If the people face war, they may change their minds and return to Egypt.” 18So God led the people by the roundabout way of the wilderness toward the Red Sea. The Israelites went up out of the land of Egypt prepared for battle. 19And Moses took with him the bones of Joseph who had required a solemn oath of the Israelites, saying, “God will surely take notice of you, and then you must carry my bones with you from here.” 20They set out from Succoth, and camped at Etham, on the edge of the wilderness. 21The Lord went in front of them in a pillar of cloud by day, to lead them along the way, and in a pillar of fire by night, to give them light, so that they might travel by day and by night. 22Neither the pillar of cloud by day nor the pillar of fire by night left its place in front of the people. The Season of Lent is the wilderness season. It begins in the wilderness and ends in another wilderness until Easter bursts forth. And in between those wildernesses are the stories of the way of the wilderness. Lent is about fasting from what we know and feasting on what we find in our roundabout way through the wilderness. There are, of course, many mentions of wildernesses in the Scriptures. The NRSV touts 287 times that the word “wilderness” shows up. Well, there seems to be a recurring theme here. Maybe it’s not that wilderness just keeps cropping up in our Scriptures; maybe the Scriptures are rather about the wilderness, or, more specifically, a rhythm of going and return, forsakenness and deliverance, hopelessness and redemption. The Scriptures begin in the wilderness. Genesis 1 doesn’t specifically mention the word. But in its place is a depiction of it as a formless void filled with darkness. It is where we begin and then God recreates it into order and light. Pilgrimage, or journeying, is a way of life. And all of us struggle along the way. The wilderness is part of our story. It is part of us. It is the way we grow in our faith. When you read the Exodus passage above, we are told that God sort of “redirected” the people through the wilderness to avoid the land of the Philistines. And there they wandered for forty years, through a wilderness with no real “roadmap”, through shifting sands and places devoid of landmarks. They journeyed through hopelessness and forsakenness, continually asking questions and doubting that God was there at all. But they grew. They grew to know God, grew to know themselves. What they found in the wilderness was their identity. 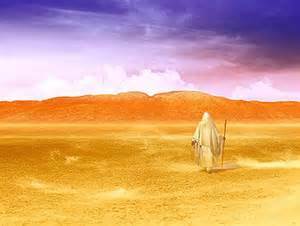 The sometimes harsh lessons of the desert transformed the people into God’s people. Led by a cloud through the desert, the people became people of faith. We are no different. This season may sometimes seem to be a roundabout way through the wilderness. We encounter the dangers of hopelessness and forsakenness; we experience the dangers of questions and doubt; and somewhere in there, if we give ourselves the chance, we are recreated and transformed into newness and life. During this season, we keep hearing over and over to empty ourselves before God and open ourselves to what God is showing us. It is our season of unmasking, peeling off all of the layers that do not belong to us, that make us someone who we are not. Leo Tolstoy once said that “there are many reasons for the failure to comprehend Christ’s teaching…but the chief cause which has engendered all these misconceptions is this: that Christ’s teaching is considered to be such that it cannot be accepted, or even not accepted, without changing one’s life.” The wilderness is what changes us, what changes our life. FOR TODAY: Embrace your journey through the wilderness. Make it your story. This is your beginning. Place yourself at God’s disposal and change your life.